Pop-Up Pyongyang: Training Locals through Small-Scale Projects — Choson Exchange - Visit North Korea & Support Local Entrepreneurs! (This is part 2 of a two part series by Calvin Chua. The first part can be found here.) Apart from delivering basic infrastructure, such as smooth roads, constant electricity and water supply, leaders in the DPRK need to rethink whether large-scale physical projects, especially for the tourism and service sector, are the only way to achieve their grand visions. Instead of looking at fulfilling big quantitative targets, perhaps it is time they look towards small-scale quality interventions within the existing city as a possible alternative. These small projects could include short-term pop-up spaces that could host restaurants, cafes and exhibitions, common elements within the developed world but currently absent in North Korea. Being smaller in scale, these interventions will be less costly in the initial investment, less susceptible to political changes and the results can be evaluated within a shorter time frame. More importantly, it exposes the locals to the concept of ‘experience’ that is crucial for the tourism and service sector and encourages locals to be more entrepreneurial and collaborative between different disciplines and organisations. These pop-ups could be local and foreign joint collaboration between restaurant and event managers, with designers and builders fulfilling the spatial requirements through refurbishing an existing interior space or creating a temporary pavilion. In addition, events and exhibitions that are normally held in specific locations can be introduced to these pop-up spaces. The collaboration between local and foreign experts in various fields could be achieved through a series of workshops while these pop-up spaces could last for a couple of weeks to a month. Such collaboration with foreign experts in various fields is pivotal in ensuring some level of success of success in the pop-ups, through the gradual training of the locals and exposing them to these ideas of service and experience. There could be three potential effects through these collaborations. First, it encourages collaboration between disciplines and organisations, which is currently lacking in the system, especially within the construction industry, where there are multiple organisations with overlapping functions. Second, it encourages entrepreneurism amongst the locals, which in turn trains their understanding of quality visitor’s experience for the tourism industry. Third, the potential success of training locals through an incremental way can be rolled out to other cities or adapted in existing tourist resorts. As for the location, the city of Pyongyang could become fertile ground for these pop-ups to take place. 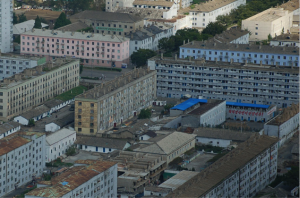 Compared to other provinces, Pyongyang has better infrastructure and resources to start with. In addition, there are several disused and run-down sites within the city that can host these pop-ups, which hopefully in turn can be the catalyst for urban regeneration in the city. In conclusion, it is important for North Korea to reevaluate models of development. As visionary as the plans to roll out large numbers of SEZs may sound, their eventual reality as witnessed from existing examples, are likely to achieve only mediocre results if there are no fundamental changes to the way the system operates at all levels. Instead of going for large-scale projects, small-scale interventions may offer an alternative to kick-start development/design growth in the country.